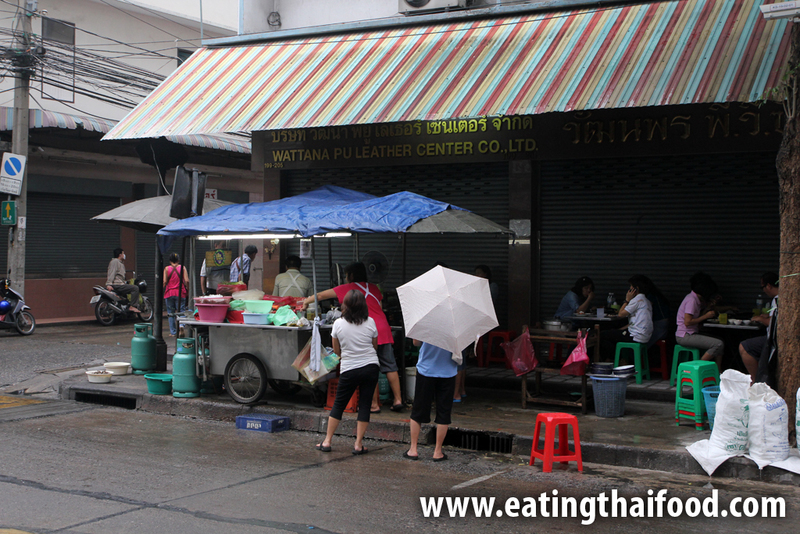 While oftentimes Thai street food comes at very affordable prices, other rare times it can be expensive (relatively). But let me tell you, if you’re paying top prices for Thai street food, your money isn’t going towards the nice ambiance or the perfect service, you’re paying for high quality ingredients. 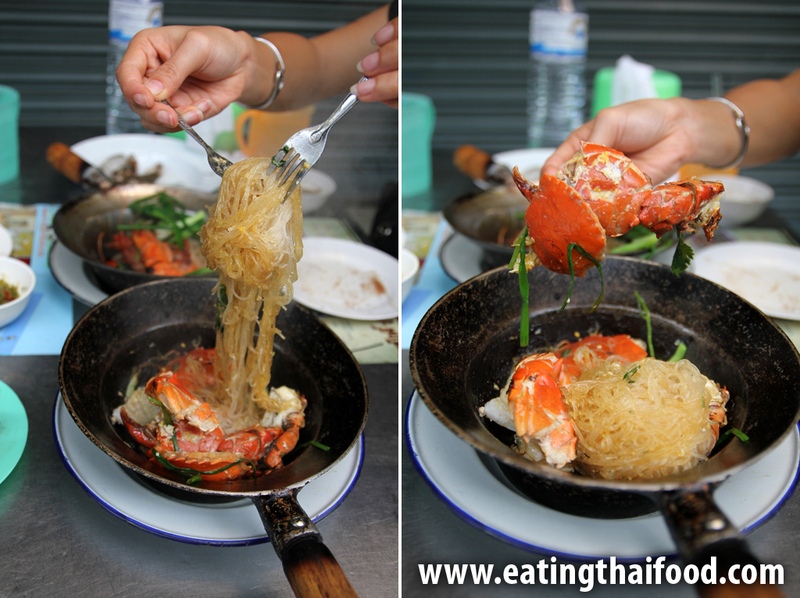 Located just a 5 minute walk from Bangkok’s Wong Wian Yai, on Charoen Rat Soi 1, is a street stall that lives up to its reputation of having the BEST goong (shrimp) and pu (crab) ob woon sen (with vermicelle, baked in a small pan) in the city (at least by far the best I’ve ever had). Starting at 5 pm each evening Somsak Pu Ob (สมศักดิ์ ปูอบ) takes position along the sidewalk. This is the type of Bangkok street food stall where Mercedes driving CEO’s share the same tables with those like myself who scraped up our final 1 Baht coins to claim a seat. Reaching out their claws and begging to be devoured! The recipes used at Somsak Pu Ob (สมศักดิ์ ปูอบ) are simple, but it’s the superb quality of ingredients and the pinpoint timing of the cooking that makes it so extraordinary. 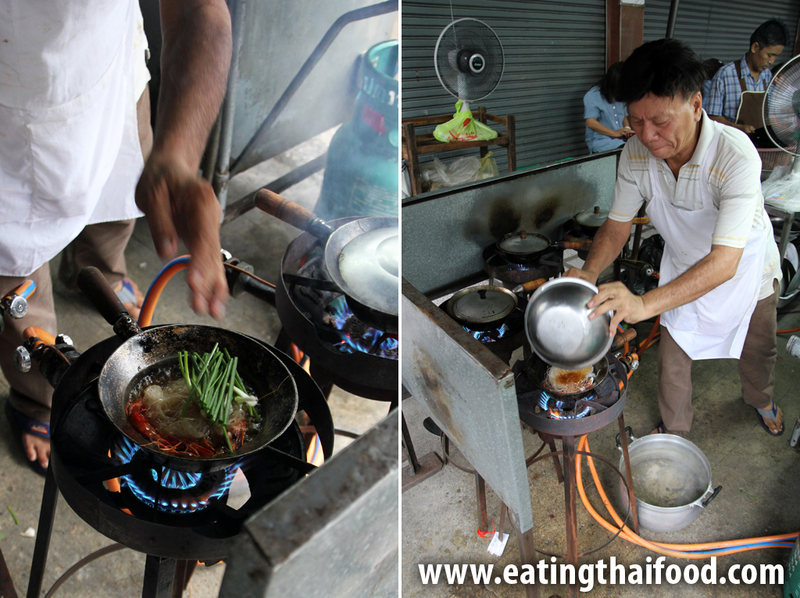 Unlike places like Pad Thai Thip Samai where the fame of their pad Thai made them expand into hiring 10 chefs to produce quantity, one thing I admire is at Somsak Pu Ob (สมศักดิ์ ปูอบ) it’s just a single chef, and he only cooks four pans of goong ob woon sen (กุ้งอบวุ้นเส้น) at a time – keeping quality and precision at its highest. The shrimp, or crab, are first added to the skillet along with a few seasonings, and placed over the flames which are so hot they could probably be used as a welding torch. 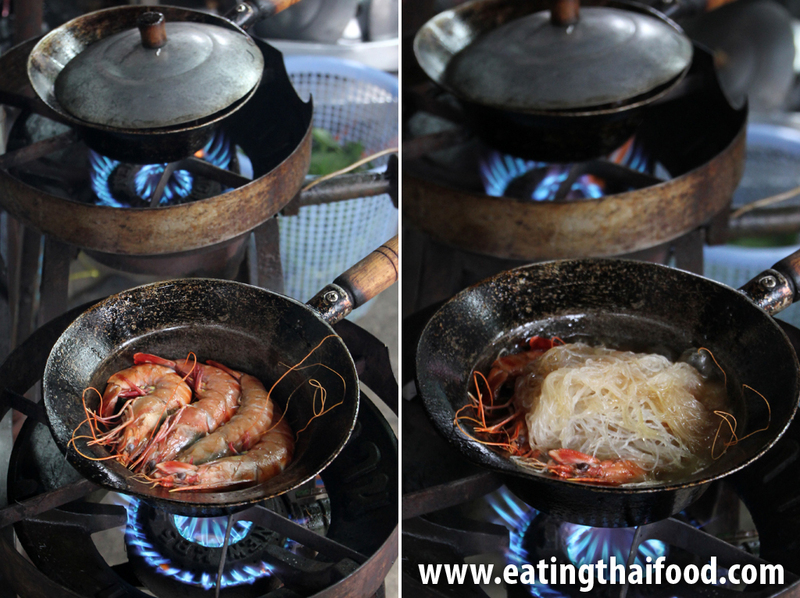 A mixture of glass noodles and soy sauce is then added to the top of the shrimp before a handful of green onions is placed on top. I’ve had goong ob woon sen before, at places like Kuang Seafood, but after eating this goong ob woon sen, I can tell you that I’ll never be ordering this dish again anywhere but here. I would probably be disappointed with any other version. Depending on how many orders are before yours, which can be quite a few, will determine how long it takes for you to get your food. 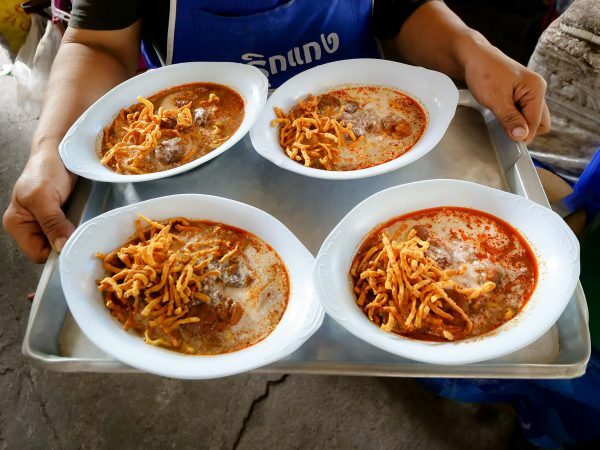 And while Thai street food often comes within 5 minutes, you can easily wait 10 – 20 minutes, or even much longer (sometimes to even get a seat) at Somsak Pu Ob (สมศักดิ์ ปูอบ). Just begging to be devoured! 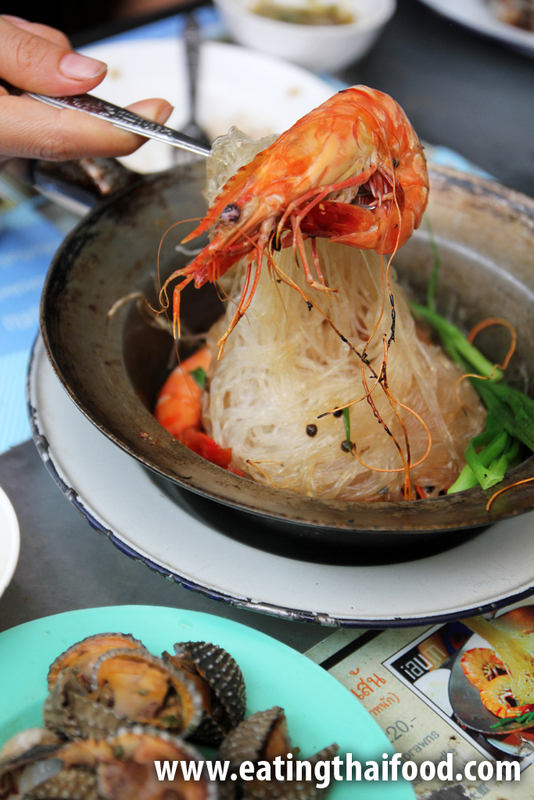 Within the Goong Ob Woon Sen (กุ้งอบวุ้นเส้น) were four jumbo prawns (even larger than those beauties in P’Aor’s tom yum goong), a handful of glass noodles, and green onions. 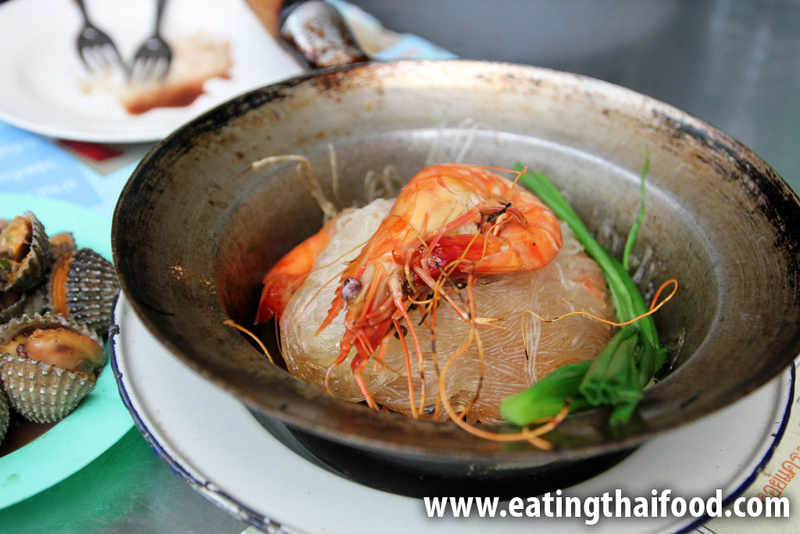 The prawns were so meaty and had a brilliant muscular texture; They were also cooked perfectly so they weren’t rubbery and remained juicy. The glass noodles were spectacular, coated in a little pork oil and flavored with just the right amount of soy sauce, black pepper, and fresh coriander root. 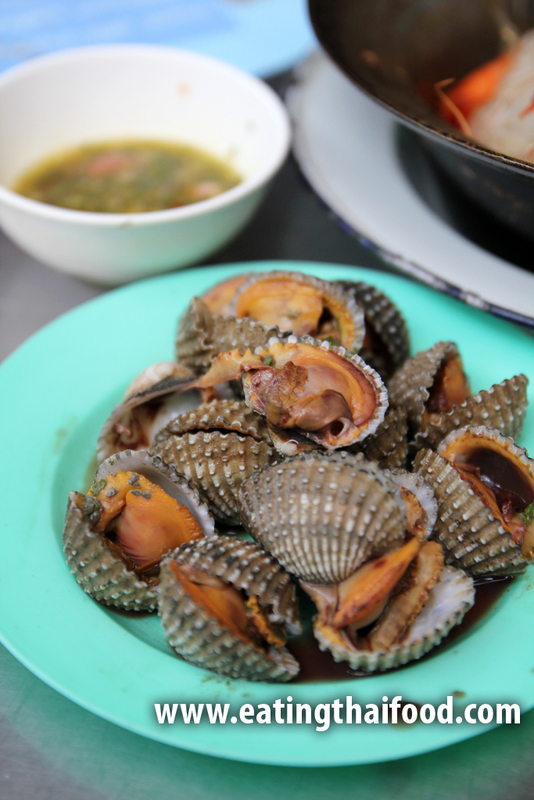 They may be notorious for their potential diarrhea causing properties (like any street food shellfish), but if you love shellfish, you’ll enjoy Hoy Kraeng (หอยแครงลวก), or blood cockles. I’ve had some that are fully cooked, others that taste almost raw, and these were somewhere in between. The key to eating hoy kraeng (หอยแครงลวก) is the dipping sauce, and at Somsak Pu Ob (สมศักดิ์ ปูอบ) they make no mistakes; It’s perfectly spicy and sour. 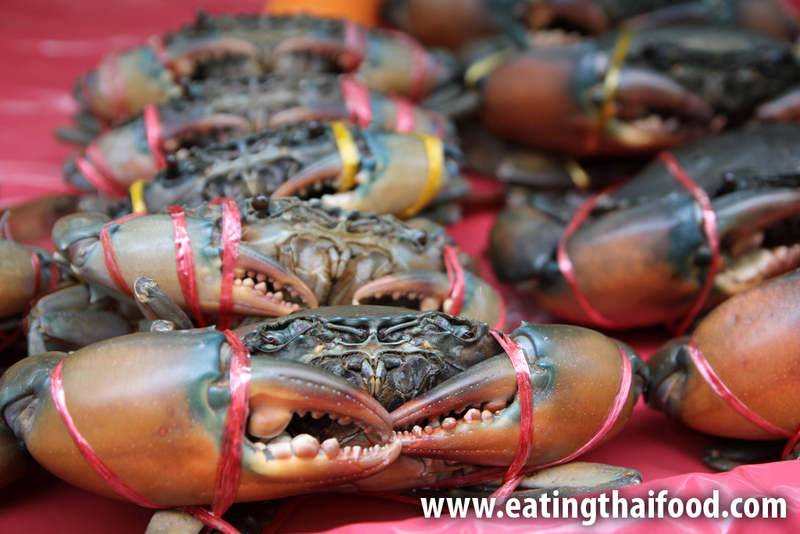 The crab version, Pu Ob Woon Sen (ปูเนื้ออบวุ้นเส้น), also arrived to our table, looking like pure glory. The noodles were a little drier, so I think there wasn’t as much pork fat used in the preparation, but they were still unbelievably flavorful. The chunks of crab were sweet and I loved the smoky flavor embedded within them from the high fire torture they received. 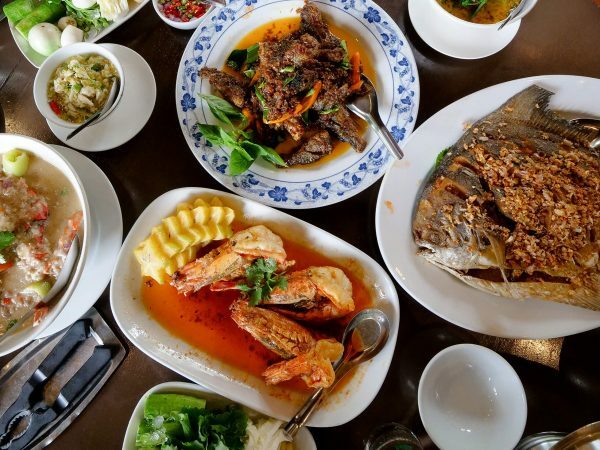 If you love juicy jumbo prawns and sweet crab claws, there’s nothing negative about this place, you’re going to love it. I personally found everything we ordered extremely delicious, and worth the cost! You can take the BTS to Wongwian Yai station. Exit towards Saraphi 3, walk straight up the road and once you get to the Charoen Rat intersection, you’ll see Charoen Rat Soi 1. It’s very close to the Wong Wian Yai roundabout. Both have the same menu, the new shop said it is the same owner. Prices have increased a little bit, (cockles 70 baht instead of 50 baht, the top quality crab is 500 baht per kg). Total bill for Cockles, Mussels, Bu Op Woonsen, and water, worked about to be 460 baht. Thanks for all inspire for thaifood. Im a chef in Sweden and very interested in thaifood. I have to try the place Somsak Pu Ob, its look havenly??? ?i travel to bkk 25 of nov… look forward to be there when the restaurant open, soo they not sold out the best ingrediens???? This stall is dishonest. Gave us two crab that is obviously one bigger than the other and tried to charge us 400 baht each. When we queried, they claim that the weight is the same. I wish I can post the pic I took here. It’s so obvious that it’s not possible that even the blind can tell. Hi RSW, sorry to hear about that. I haven’t been here for a while, though I haven’t heard that anything has changed. If I find out any news, will let you know. Thanks. Fly to BKK tonight love your reviews is this place still going? looks awesome! Hey Matthew, great to hear that. This place is still going, but it’s been a while since I’ve been. Hope you enjoy! Mark… Your website and YouTube posts have been invaluable to me! 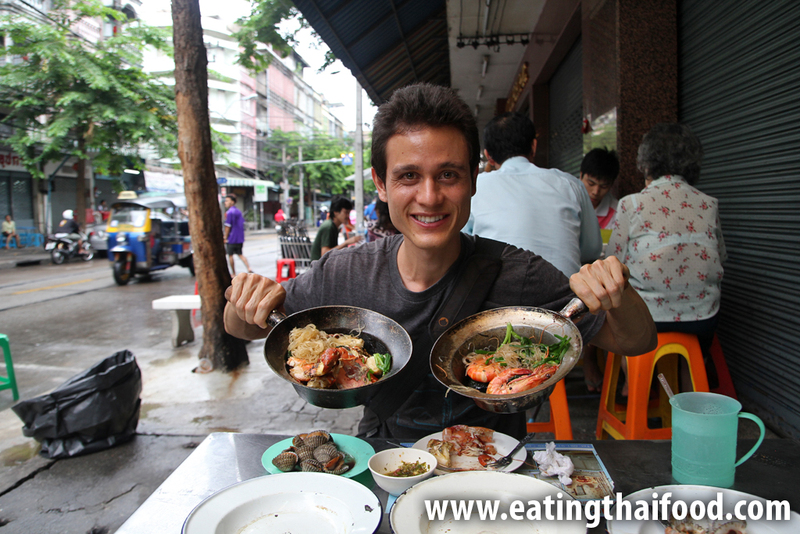 My quest to eat stunning street food in Bangkok has been well aided! Cheers! Hi we went three after reading your blog. We enjoyed the meal but we also notice that they use lard in the cooking to enhance the flavour and the dish is very greasy in an animal fat kind of way. So we will avoid eating there unless they can take out the lard, we think you should know this, to cook seafood with lard is kind of cheating. Sam, can I ask why you think cooking something in lard is cheating? I tried this last month and it really worth the journey & the wait for this delicious food. Thanks Mark for your recommendation. Great to hear that Yee, thank you for sharing, and glad you enjoyed it. Went to the place today but disappointed that the food stall does not open on Mondays as told by neighbouring shops! Please check! Hi SW, thank you for sharing, sorry about that, I’ll inquire. We just finished boo and going. We waited one hour for the food but it ess absolutely worth it. Great food! Thank you for the tip. Hey Deepak, glad you enjoyed it. thus far the best goong and pu ob woon sen, I have had in my 1 1/2 years in BKK. Thanks for the recommendation Mark. Hey Gene, thank you so much for sharing. Even though you had to wait, glad it was worth it! I forgot the Thai name of the Grilled fish, though I had it just an hour before but in English it was Black Banded Kingfish! Definitely the best fish dish I had in Thailand! Awesome, thanks for sharing Rohan! 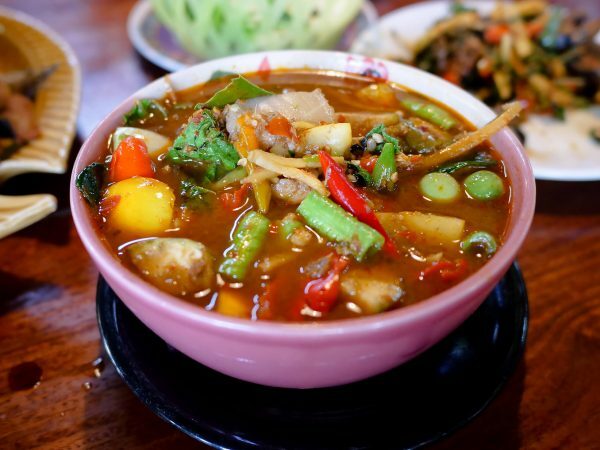 The food at Somsak looks great, I am sure tastes even better as you described! 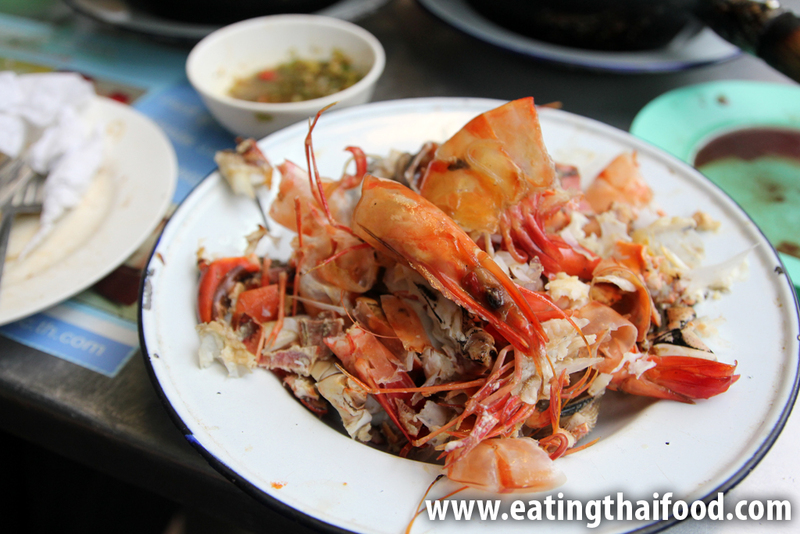 I had the most amazing Sea Food dinner in BKK a while back at “J-Khai Seafood” on Prachachuen Road! 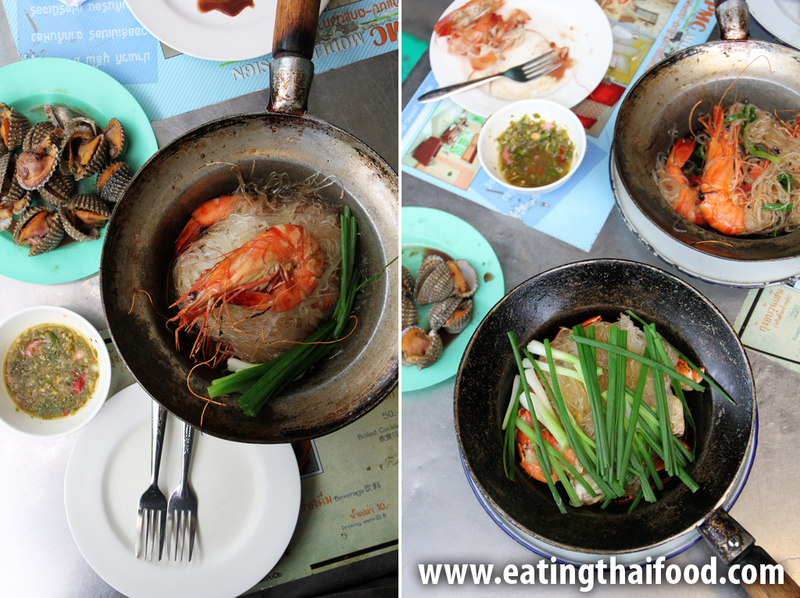 Its street side sea food heaven, very famous with local Thai people. The taste and quality of ingredients was much better than all the hyped sea food restaurants chains in BKK at a much lower price at J-Khai. I think you should give it a try (if you haven’t been there yet) and it could be a video opportunity so that more people know of this fantastic place. There is another very famous sea food restaurant “Beer Hima” near this place which was also amazing but its very very expensive by any standards. Hey Rohan, great thank you for sharing this place, it sounds fantastic. I’ll try to check it out when I have a chance! 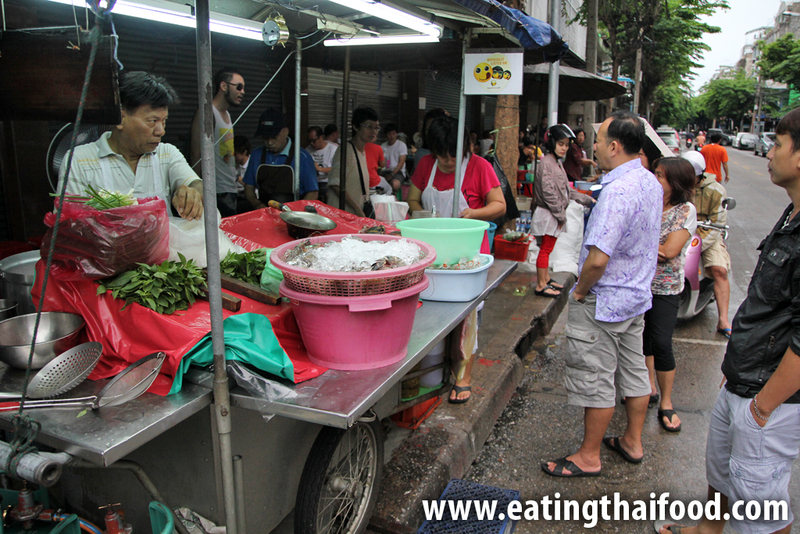 Mark, Any tips on the best street food locations around Phra Ram 9 MRT? I know you have a little crossroads just behind Fortune Town and obviously Huay Kwang night market up the road but any other suggestions? Hey Jay, I haven’t had a chance to really explore that area all that much, other than walking around the Huay Kwang market area a bit. If I get a chance will definitely explore more, but don’t have many specific suggestions now. Let me know if you find anything really good! Love that you include a map and directions to get there. Nice detail others often miss.